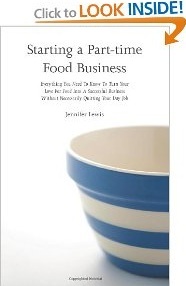 Whether you're slaving away in a cubicle dreaming of turning your mother's secret jam recipe into the next "it" food or wish you could turn your flare for flan into a moneymaking venture that doesn't conflict with your stay-at-home parenting responsibilities, it's possible to start and run a successful part-time food business. • Building a business plan that will guide decision making and set you up for success. • Obtaining the necessary business licenses, registering your business, and securing commercial kitchen space that meets health code requirements. • Determining which sales channels will work best for you based on the detailed pros and cons outlined for each option. • Understanding your true product costs and how to price your products in a way that will make you money. • The role marketing and branding play in customer loyalty and how it can help you succeed..
• Developing a system to help you keep track of business finances and detailed worksheets that walk you through the financial side of the business. • A twenty-something with modest savings who started a successful artisan ice cream company. • A mother of toddlers who not only worked a full-time job but also started a whimsical cake company on the side. • A newly unemployed construction worker who decided to turn the bad economy into his good fortune by starting a meat jerky company. A reader says, "This book arrived in my life at the perfect time. I've wanted to start some kind of food business for the last several years, but can't wrap my head around leaving my very good full time job. I've been mulling over starting a food stand at our local Farmer's Market and came home to find this book waiting for me. "The advice and tips given are thoughful, practical and concise. I'm not a person who is enjoys business plans or number crunching, but Ms. Lewis lays out how to tackle these parts of business so it doesn't seem so overwhelming. The section on how to price your product was very helpful as well. "The personal storties of people who have successfuly started businesses was fun and inspiring. Since reading the book, I've started the first few steps to get my business going and I'm sure I'll refer back to the book as a guide." Reader Katie Coleman says, "I read this book in one sitting the night I got it. Since then, I've worked my way through, and am confidently on my way to selling my product! I love the profiles of other small food business owners." Click here for more information.